I'm not going to lie. When I first heard about the theme of the Paul & Joe Holiday Make Up Collection Set, my reaction was "you've got to be joking." I don't know why I found cats and turtle doves perfectly acceptable, but unicorns? It's a good thing as a dedicated beauty blogger I don't usually knock things until I try them. I think people - including me - underestimate how good Paul & Joe products can be because they look cute. 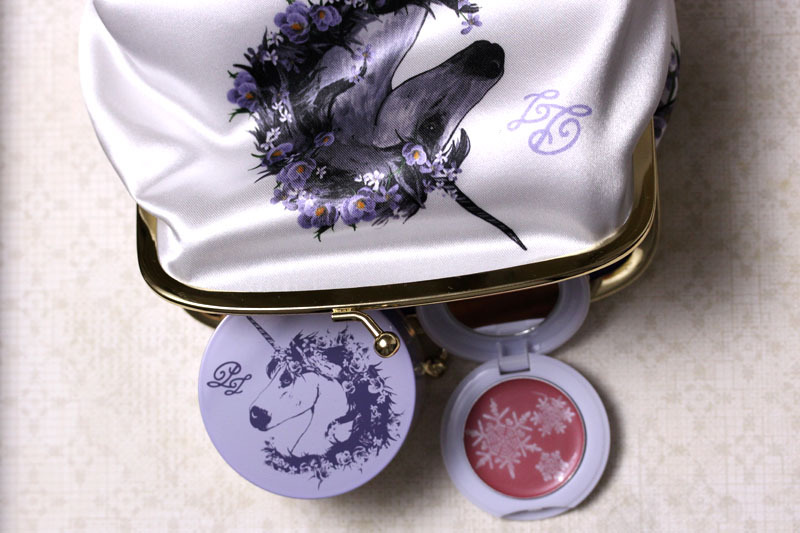 The Frozen Lilac 001 set includes a translucent powder and a creamy cheek powder. I didn't swatch the translucent powder because it wouldn't be visible on the skin. 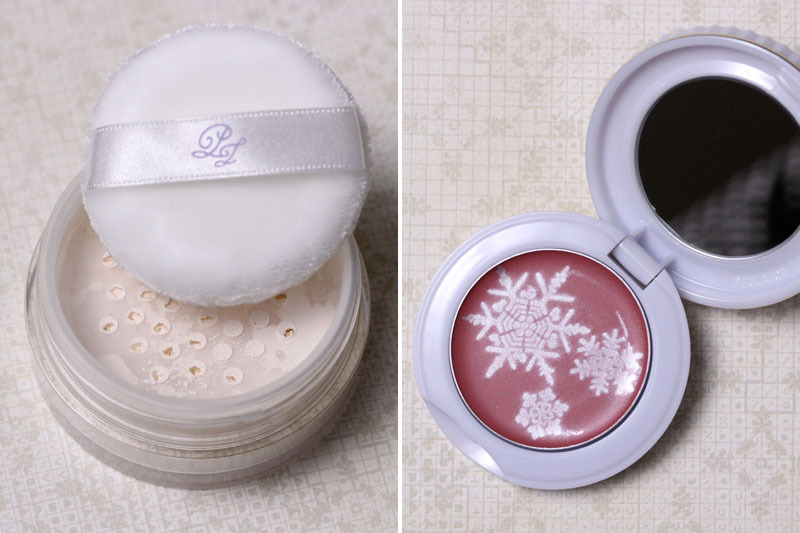 The rose-hued creamy cheek powder may be confusingly named because it definitely belongs under the cream category. When I first tried it, I actually said "this feels dimethicone-y" aloud – it feels smooth and dry, but goes on and blends into the skin with little effort. The blush stayed on strong for at least six hours and slowly fades to a very bare flush. In case this isn't clear: I love it. I wore it with Tarte LipSurgence in Escape (swatched here) and SmolderEYES in Gold (application method here) under my glasses! Paul & Joe Holiday Make Up Collection Frozen Lilac 001 retails for $65 and is available at Beautyhabit.com and Bergdorf Goodman. If you would like to call to order, you can try Caroline or Alex at 212.872.8648. Let them know I sent you! Full disclosure: This entry contains product(s) sent by the PR or manufacturer for editorial consideration. I wish P&J was still here :( They've pulled out and you're right. We underestimate them because they are so pretty to look at and yet once you get over that, the products are pretty awesome too! p/s Love your new layout! I feel bad everytime I use it and think "wow surprisingly awesome" - why is it surprising? Whyyy? Paul & Joe packaging is always so cute/beautiful. I agree that at first I didn't think they'd have good quality and just focused on their look. YAY GLASSES you look so cute. I find that they can paradoxically draw more attention to the eyes and cheekbones. 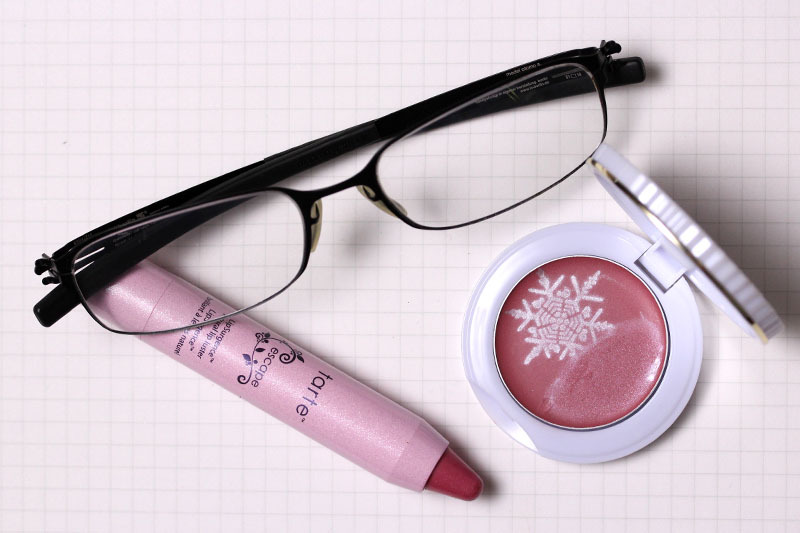 The blush swatch is a stunning color: I. Must. Get. How does the translucent powder perform? Very pretty! I also love your hair. I thought it was stunning long and you look gorgeous with it short too. I think you would look awesome if you styled it in a faux hawk. I wish wish wish I could pull that off like you! I can understand why not. In my mind, French women would like everything to be sophisticated and elegant and P&J is downright cute. I've only tried their lipsticks and powder products and I think they're both great quality-wise for the price point. Glasses Wandz is equally gorgeous. Not fair, Wandz. Not fair at all. love the glasses+hair+makeup! you look amazing! I think unicorns are quite awesome tbh :p. I'm definitely going to try out a blush now from them. And you look so pretty with the glasses! Hahaha that's awesome :) Thanks! Love the short hair + glasses combo! :) what brand are your glasses, btw? Hi Xiao! Are you pulling your eyebrows a little more to the side (aka making them longer) than you did in prior months? B/c your brows look the best I have ever seen them in this post, especially in the first photo (perfection!). to be honest, i have no idea what i do with them :P I just draw and hope they come out right. I guess I should update my brow shading tutorial one of these days. Thanks for the nice words though! Edited - I did some digging and it appears in my area I'll have to buy online. Boo. However, I'm really surprised by how reasonable their prices are. $22 for a lipstick (including case) is pretty damn good! Once I get paid, I may pick up this set. So pretty and I'm digging the glasses! Xiaoo why so gorgeous all the time?? Adore these shots of you! The makeup is adorable haha, you're right, I tend to underestimate Paul & Joe because the cute factor is just so good all the time.